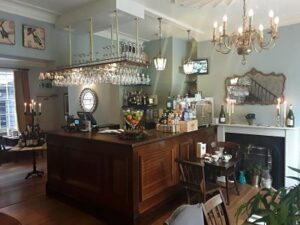 Welcome to this series of posts aiming to capture all the 100% gluten free venues in the UK. This listing covers all of Yorkshire, Cheshire, Greater Manchester, Merseyside, Lancashire, County Durham, Cumbria, Northumberland and Isle of Man, but at this stage Yorkshire & County Durham are dominating the scene. For other regions of the UK, including London, please see the UK 100% gluten free page. Please subscribe (see box to your right), or connect via Facebook or Twitter for updates. have its own outlet that you can visit, such as a shop, café or a stall at a market. If you know of a business that fits the criteria that is not listed, please let me know via the contact page. Use the headings below to jump to your preferred area, or if you would prefer a printable list, please see the restaurant lists page. You can also zoom out & drag the mouse on the map to see if there is anything in your area. Cafe by day, restaurant by night, you can find all the treats you miss at 2 Oxford Place, in the centre of Leeds. As of 2017, they are now Coeliac UK accredited. 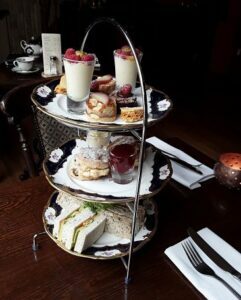 The menu changes seasonally, but you will find the elusive fish and chips, fish pie, pancakes for breakfast, a lovely range of desserts and special afternoon teas. At Wildcraft Bakery we refuse to be denied our guilty pleasures by our digestive systems! 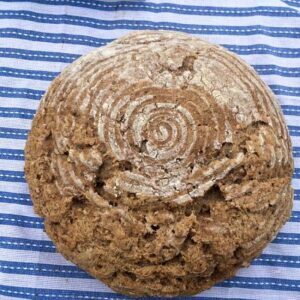 You will find bread in many forms, including baguettes and bagels as well as sweet treats. Not only gluten free, but also allergen conscious with savoury options that are vegetarian, vegan and sugar free. Oat free options also available. Check the website for the daily baking pattern to know what will be available. You can stop for a cup of coffee or soup too! Removed from listing Nov 2018 as no longer 100% gluten free. Available from an on campus vending machine, Mr Lee’s are the 100% tasty, 0% nasty gluten-free gourmet instant-noodle in a cup. Their award-winning range of six authentic, oriental noodles are the market’s lowest in salt, sugar, saturated fats and calories, with no MSGs, artificial preservatives, flavourings or colourings. They uniquely use freeze-dried ingredients to ensure that the product locks in most of the nutrients. Vegan options are also available. It is a cashless/mobile payment machine that gives students access to hot, healthy foods that are prepared quickly. Sadly El Piano closed after 20 years, in August 2018. Previously at 2 Oxford Place in Leeds (where The Oxford Place now is), this cafe has reopened in York for brunch, lunch, coffee, cake as well as dinner service on the weekend. There is a good choice of traditional breakfast items and lunch options include fish and chip, pies, ploughman’s and sandwiches. You can see more options on their menu online. You also of course can just have coffee and cake! Click here for a news article on 2 Oxford Place. 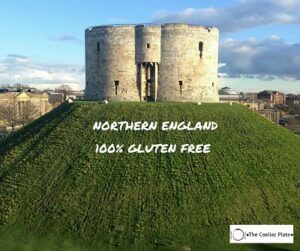 Click here for more information on eating gluten free in York. 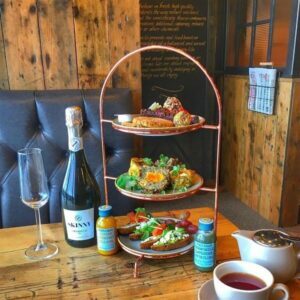 Vegetarian/vegan gluten free café serving breakfast, lunch and desserts. 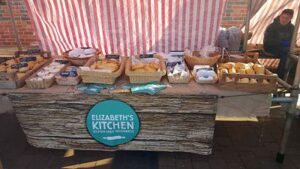 Everything is made on site – paninis, soups, scones, cakes, afternoon teas. Vegetarian and dairy free available. Dog friendly! 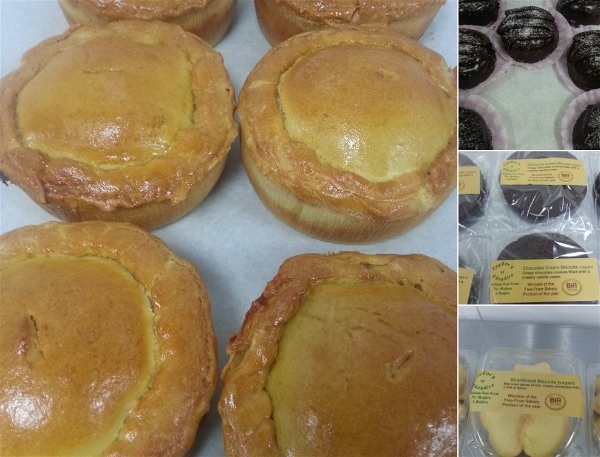 A dedicated bakery producing gluten, wheat and dairy free cakes, puddings, savouries and bread. Order online or find them at a local Food Fair they are attending – see Facebook for more information. Above is the chicken & bacon pie and the apple crumble served with some ice cream. Find the full range at Cambells of Leyburn, but see website for other stockists. All products are made with locally sourced ingredients, no unnecessary added sugars or salts, no preservatives and nothing processed. An entry is expected soon for East Riding of Yorkshire at Market Weighton market. 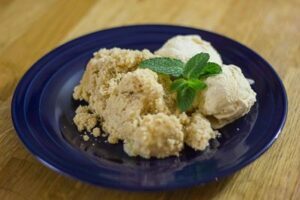 A not for profit café catering for more than just gluten free – lactose free, vegan and vegetarian options and other special diets will be accommodated – just ask! Cooked breakfast, porridge, pancakes, burgers, sandwiches, lasagne, chilli. 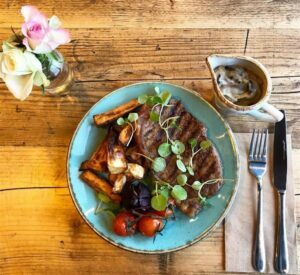 Serving breakfast, lunch, dinner, drinks and coffee, the menu is centered around fresh, high-quality ingredients without the additives or refined sugars. If you are vegan or vegetarian there are plenty of options. Takeaway is also available. 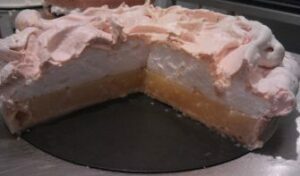 A dedicated gluten and wheat free bakery producing cakes, puddings and savouries, with some products also dairy free. All products are tested and are below the 20ppm guidelines. This is a family run business run by a coeliac with a milk intolerant daughter. Items can be can be ordered for delivery or bought in person from Darlington Market. They also attend some Coeliac Group meetings and Food Fairs (eg York Food Fair, Leeds Food Fair, Lincoln Food Fair). Check website under Events for more details. There are currently no entries for Cumbria. 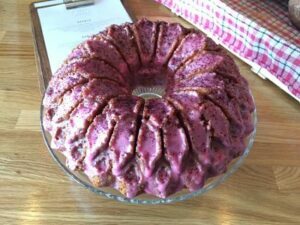 Local family business that loves everything about baking. Their specialities are flavoursome gluten free friands as well as bespoke celebration cakes (pre-order), all made in a dedicated gluten free kitchen. 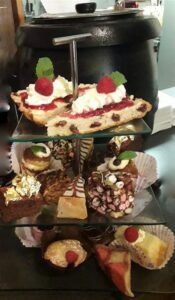 They also produce a wide range of individual cakes based upon traditional classic desserts, using the finest and where possible, locally sourced ingredients. Simple and good food, fast. Powerbox meals (eg curry, meatballs), wraps and refined sugar free desserts. Catering for vegan, vegetarian, paleo, ketogenic, SCD, GAPS, FODMAP, or any other diet protocol. Home meal plans also available. Eat in at the restaurant or order via just-eat.co.uk for Wigan or directly for Hindley (lunchtime only). 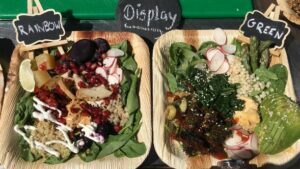 GF food mobile van that attends events around the north of England and Wales run by a coeliac and gluten intolerant – see Facebook for details of events attending. Also available for catering. 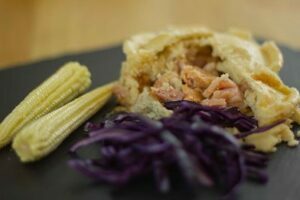 They are also a manufacturer and distributor where you can pick up orders for pies, sausage rolls, pasties, puddings, cereals and bread from their kitchen in Burnley. Deliveries also available within 20 mile radius. 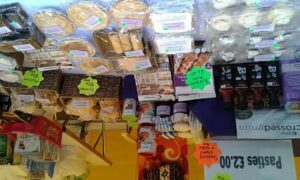 Producing a wide range of gluten free sweet and savoury goods with a good selection of dairy free options. 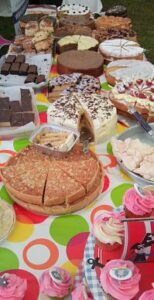 Full size cakes, such as Victoria cream sponge, lemon drizzle cake, sticky toffee and bakewell, as well as single portion items such as scones, cupcakes and caramel shortbread. Savoury goods include a wide range of pies (including vegetarian options), quiche, garlic bread and focaccia. All products are formally tested for no detectable gluten and wheat. 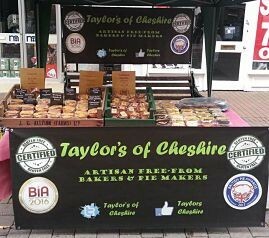 Also check Facebook for attendance at other events, such as Southport Farmers’ Market and Wirral Coeliac Food Fair. Products can also be purchased at Helen’s Gluten Free Kitchen, Toulmin Block, Bury Market BL9 0BD on Wednesday, Friday and Saturday and at local cafes. This bakery closed mid 2018. 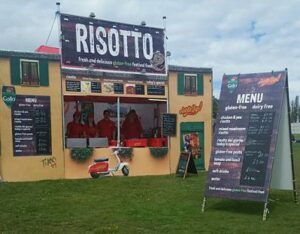 Risotto food van that appears at festivals around the UK. 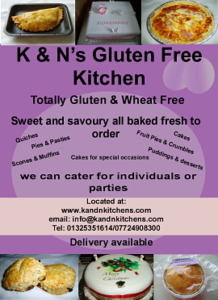 GF food mobile van that attends events around the north of England and Wales run by a coeliac and gluten intolerant – see Facebook for details of events attending. 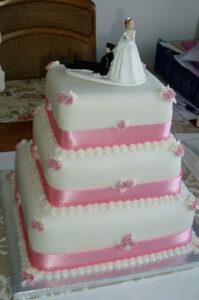 Also see their entry under Lancashire for ordering and catering. Photo credits: All photos have been provided by the businesses unless otherwise noted and they retain the ownership rights to these.